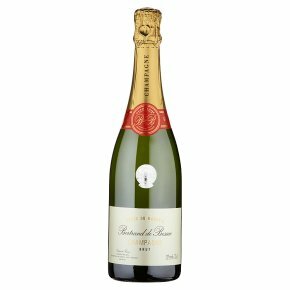 Exclusive to Waitrose, Bertrand de Bessac Champagne is made mostly from first year wine with 25% reserve wines from previous vintages. This crisp elegant champagne has citrus and grapefruit flavours with delicate biscuity notes. A fine mousse complements the fullness on the palate and culminates in a long, zesty finish. The perfect choice for celebrating; serve as an apéritif, with smoked salmon canapés or fish and seafood dishes. Wine of France. Made from Pinot Noir and Chardonnay, this crisp elegant champagne has citrus and grapefruit flavours with delicate biscuity notes. A fine mousse complements the fullness on the palate and culminates in a long, zesty finish. The perfect choice for celebrating; serve as an apéritif, with smoked salmon canapés or fish and seafood dishes.